Keeping Cool in the Quality Lab | KLH Industries Inc. The quality lab can be a stressful stop in the manufacturing process: final inspections, tight tolerances, and critical dimensions. The pressure can get the overwhelming and blood boiling, but at KLH Industries, it's tough to break a sweat. With a designated air conditioning unit, KLH's newest business unit is both temperature- and humidity-controlled to reduce the thermal expansion of materials. Thermal expansion - the effect temperature has on the size of an object - is a principle affecting every CMM. In everyday life, thermal expansion is the reason why telephone pole wires hang lower on summer days, or why hot water can loosen a metal lid stuck on glass jar (metal expands more than glass). In the quality lab, every metal has a unique thermal expansion property, but when calculated volumetrically, or across all three dimensions, it can have a great effect on dimensional and location accuracy. For example, a 20 in cube of aluminum with a tolerance of +/- 0.001. An increase of 5°F would expand that cube to 20.0012 in. A change capable of producing non-conforming parts when manufacturing for the aerospace industry. According to Brown & Sharpe's factory specifications, optimum inspection temperatures for CMM’s range from 18 to 22oC. Readings taken outside of that range, as one quality engineer described them, are "junk." Monitored by a Dickson TH800 temperature gage, an audible alarm sounds when the quality lab approaches unacceptable limits. Additionally, every CMM report produced by KLH comes with temperature stamps, so customers know the exact environmental conditionals that produced the results. Unscrupulous shops may try to knowingly altering inspection results by adjusting temperature. How can you be sure that your or your vendor's inspection results are accurate? Contact KLH to do it. Controlling temperature not only provides accurate measurements, but also provides precise - or repeatable - measurements. A temperature-controlled quality lab ensures a cool 20oC for inspection repeatability, giving quality engineers nothing to sweat about, not that they could. 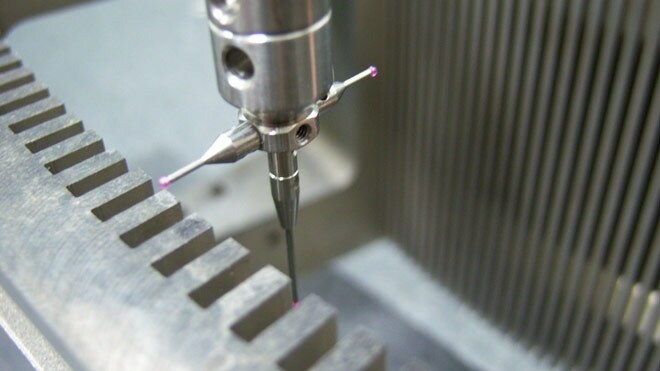 Waterjet Filtration a Sign of a "Modern Machine Shop"